SEABRCWA is an all-volunteer, community-based service organization working in partnership with the Redcliff and Bow Island RCMP. Our focus is on a safer rural community. Crime of any nature is unwelcome. To distinguish rural crime from urban crime seems unnecessary, but rural crime is different. Rural crime brings to mind agriculture and family farms,sparsely populated areas and a sense of community where the people know one another and act accordingly. Unfortunately, fewer people in rural areas leaves open various opportunities for criminal elements. While rural areas have less crime than their urban counterparts, they also have more crime than they did in the past, and their crime problems are serious. It is up to the neighbours and family members to be ever-vigilant about what happens a few miles down the road. Our goal is to increase and strengthen crime prevention activities in Cypress County, County of Forty Mile, and its municipalities through broad citizen participation. Communities in our coverage area include: Aden, Agatha, Alderson, Bain, Bellcott, Bowell, Bow Island, Bowmanton, Bullshead, Burdett, Comrey, Conquerville, Cressday, Dennis, Dunmore, Eagle Butte, Elkwater, Etzikom, Faith, Fitzgerald, Foremost, Fox Lake, Goddard, Hilda, Hoping, Illingworth, Irvine, Jaydot, Juno, Larmour, Legend, Little Plume, Lucky Strike, Macson, Maleb, Manyberries, Many Islands, McNeill, Nemiscam, Norton, One Four, Orion, Pakowki, Pashley, Pendant d'Oreille, Pinhorn, Pivot, Ralston, Ranchville, Redcliff, Ronolane, Rosebeg, Roseglen, Schuler, Seven Persons, Skiff, Suffield, Thelma, Tothill, Vale, Veinerville, Westdington, Walsh, Whitla, Wild Horse, Winnifred, Wisdom and Woolchester.  "What happens when you call 9-1-1?" 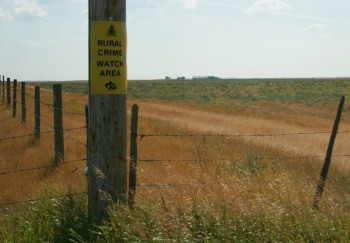 The latest in videos posted by the Alberta Provincial Rural Crime Watch Association. Watch this and other videos on their YouTube channel.  We're launching our 2019 Poster Contest in March to all the local schools, in Cypress and Forty Mile Counties.  Thanks to everyone who volunteered for our Casino in October. We couldn't do it without you!  We have member signs available. "No Trespassing" and "RCW Member" signs are available in plastic or reflective aluminum. Click here to get yours!